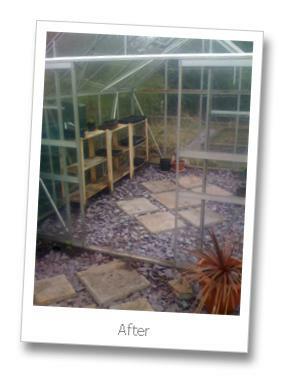 In a true Alan Titchmarsh meets Sarah Beeny stylee I spent the weekend giving my greenhouse a bit of a revamp. As can be seen from the "Before" picture the place was a bit of a health hazard with odd bits of paving making up the floor. Some might argue, and I am of course referring to my darling wife here, that this is what a proper greenhouse should look like…but not I. 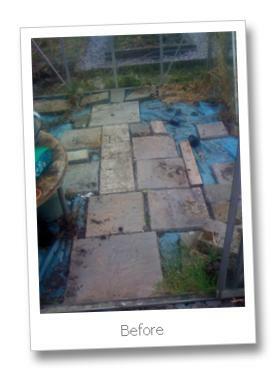 The newly revamped greenhouse has a light smattering of plum slate chippings at 70 quid a tonne [ robbing bastards ] with a lovely geometric pattern of paving stones forming a centrepiece. This bijou little residence is now home to 70 germinating onion seeds, a bunch of pepper plants and some other stuff that I planted that I have since forgotten. So that’ll be a nice surprise in a few months.